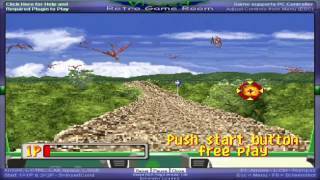 Play Jurassic Park online with Arcade browser emulation for free! 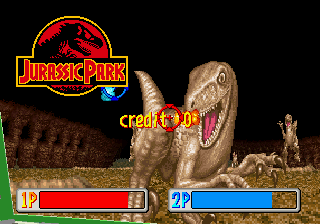 Jurassic Park (MAME) game rom is loaded with features in our flash, java and rgr plugin emulators. Nothing to configure, we've done it for you! 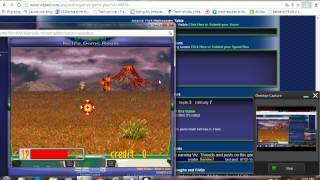 Vizzed: Let's Play Jurassic Park Arcade Part 1: I'm a Bad Person. Sega one day decided to work on a movie game that was so good, it didn't matter how much sense the game made half way in, it was just GOOD! This is a game many children have played back in their days as Chucky Cheese or just in the local arcade or something and to this day, and if you met one of these kids and said, "Jurassic Park Arcade?" they would say. "Oh my god how many years has it been!?" or something amongst those lines. 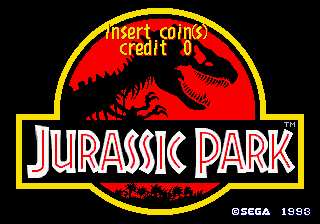 Jurassic Park's first arcade game was a smashing hit, especially considering all the places I've seen this arcade, inside and outside the states. What is it that made the game so addicting!? Why did we pour all our quarters into beating this game!? Well let's find out what makes this game so cool...and analyze how much sense this game makes possibly even if it isn't that big an issue at all. This game can literally be beaten in 15 minutes at the least, well, a little under 16 minutes we my fastest record, but even a game this short, can be so exhilarating. This arcade game is literally a small bundle of joy. From beginning to end, you might possibly enjoy every second of this game(if your controls work well enough depending on keyboard or gamepad) and remember a lot of parts here and there. When you start the game, you drive your jeep in the stormy night to approach the gates of Jurassic Park which slowly open before you. You continue to drive, thunder storming away until suddenly, A T-REX APPEARS AND CHASES YOU! You turn in your seat, gun blazing away at the dinosaur's huge head as it attempts to get close enough to enjoy his snack for the night. However, you eventually lose the T-rex as you drive through the tunnel passage only to find more dangers ahead on your journey...to recklessly murder every dinosaur alive without any reason whatsoever. There are no points in this game at all by the way, your mission is literally to survive and murder a species that luckily can protect itself. 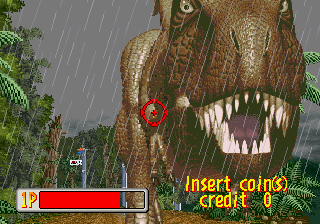 The game really doesn't have a story at all, even if the ending makes it look like you were putting all the dinosaurs to sleep, which I can't agree with considering that you use rapid fire machine guns and the dinosaurs make a death scream when you've shot them to death. In general, it's just a straight up, rail shooter in it's finest condition. The game is pretty exciting with quick reactions to fend of dinosaurs that may get too close to your jeep. The level design on the other hand is just insane that it is awesome, while including a few hot spots from the original Jurassic Park movie. A good example of insane level design that really doesn't make too much sense but at the same time does is when you find Triceratops running away from the disaster that caused dinosaurs to go extinct. The lands are all burnt, trees are on fire, volcanoes are erupting and meteors are falling. Very interesting and creative but, not really possible on Jurassic Park or it would have occurred in the other movies. Either way, I love some of the crazy things the game has to offer, or otherwise it would have been a very boring game if it were too realistic. Other than that, there isn't much else to this epic Jurassic ride (it makes you wish this was the ride at Universal Studios). For a short game, Sega made a great choice making it difficult enough to where you've wasted all your tokens and hope you are fast enough to exchange money for more before you time out. Of course, on Vizzed.com, we have unlimited tokens, so no worries. However, that doesn't mean you won't die at least 4-5 times throughout the whole game, which is also my personal record after playing the game through 3 times in a row. Naturally, if you exchanged 5 dollars for tokens, you'd have 20 tokens, and there for 10 lives. This would be at first how many tokens you'd need if you managed to not die on each new sections and perhaps every 3 sections or so. Still, that's a lot of lives to be a short arcade game so it must be pretty difficult. But Why? Why is it difficult? It's difficult because there are so many things on screen at once, you only have 1-2 seconds to shoot as many as you can before you get hit. There will be some parts where it seems impossible to not get attacked by a horde of dinosaurs at once, but trust me, it's not. 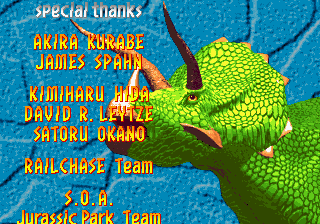 At first, I used to die at the end of the first level to the angry triceratops chase. But then I figured out their patterns in how the worked and only took about 4 hits from one triceratop rather than many at the same time. It's all just about concentrating on as many as you can, and when something gets close, only concentrate on that target before quickly shooting the rest. So, eventually, you'll be working towards mastering your skills at trying not to lose more than a certain amount of times. There are actually around 5-6 parts where it is impossible not to get hit a lot, such as the t-rex fights, or the boulder chase. But in the beginning of every level, you will find four first aid kits, and even this can make a huge difference in how many times you will lose. Other things that make the game challenging are, the speed, yourself, accuracy, and most important of them all...YOUR CONTROLS! In this game, since we don't have the original arcade machine, the controls are the worst thing about this game. If you use a keyboard, hopefully, just hopefully it works with digital movement. I've only used the other MAME emulators that allow you to use digital speed to prevent the cross hair for centering itself, but I use a gamepad, and even that is annoying. If I use the direction pad, the cross hair will still center itself making it impossible to steady my aim at all! However, using the joystick allows me to aim more precisely, but that is an amazingly hard task to adapt to because not only is the joystick very sensitive, diagonal motions are twice as hard as steadily aiming left and right. So it's not your fault that you die a few times, it really isn't. The controls can just as well make your life miserable. Aside from this, the game is still very fun. When fighting the T-Rex boss the second time in the middle of the game. If you don't shoot, his life bar will automatically waist itself faster than you can damage it. I've actually used this trick to save my self a large amount of the lifebar once...the trick will always work, but the damage you sustain won't. I just got lucky. I don't know if this works on the final fight...but, seriously, why can the T-Rex kill itself? I don't think I'd need to explain much to tell you why this game is addicting but, the way it is designed keeps me hooked to the game and always happy every time I play it. I've never once told myself no to playing it. I guess the best way I could explain it is, that the game's design makes it fun and enjoyable for all ages. It's simple to play, yet challenging to beat. Not to mention, the fact that it is Jurassic Park with a crazy twist to it makes it very interesting. But asking myself why I keep playing the game is really difficult because, I seriously don't know what else to say. It's just like Time Crisis with all it's awesome shooting action. There's so many things to shoot at in Jurassic Park, and even a lot of things to spot like the camera signs on the mount highway. Whoever put that there encourages taking pictures of pterodactyls trying to murder you. In short, there is just so much charm to it, you'll never understand it until you actually play the game. The graphics aren't that bad. In fact, it's better than a few games I've seen that have used the same engine. I'm just getting straight to the sauce with the larger dinosaurs that use multilayer shapes to create a perception of length to them. It certainly is a big improvement from Space Harrier. 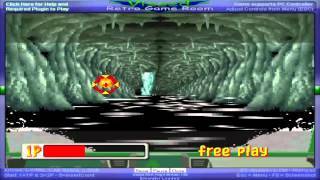 If you haven't played Space Harrier, in the game, there are bosses that I guess are pretty much dragons. Their long bodies are portrayed with ball shapes which show length because the perspective that you seem them is a straight forward rail shooter angle. I notice a similar technique was used with Jurassic Park, however, much better than what it used to be on the genesis. It's hard to tell if the shapes are really 2d, or 3d which I personally find awesome. Aside from this, most of the enemies are all 2d based but they are placed int he railshooter in such a way to make them pop out to your 3d vision somehow. It's hard to put it, but it looks awesome even if the graphics aren't THAT good, since the technique stands out. The rail stage design is ok, as it does feature lots of grass, jungle bush, forested areas, bridges, highways, water, and earthy obstructions. Sometimes you'll notice how the ground is simply a row of thousands of 2d flaps, which you'll notice with bush textures. However, the background design caught my interest a few times. 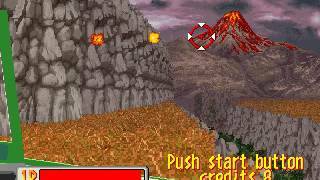 In the beginning of the game after you exit the cave, you may notice the mountain hill in the back full of large bush or trees perhaps. I am always curious whether that was a picture shot from real life, or if it's just pure art. That image always stands out in my mind so, there will be some things that look pretty awesome really. If anything, the ideas that went into the themes of the stages are pretty good! Try to actually find the differences in similar environments such as caves, I'm serious. I don't let things that I alone may take notice to slide, I really don't. The music in this game is very upbeat and does so well to capture a feeling of distress and intense action. However, most of the music in the game is LITERALLY a very short midi loop! One of the songs I decided to time was only an 8 second looped song! Not that it's bad, because it's generically possible to loop the songs used over and over to where you won't notice it. It's not too bad...but...it's not anything that good sadly. But I'm not saying that in a bad way either. It's just nothing too special, but it's good enough that it sounds pretty fun but...Well, what really matters is that it has stayed in my mind so I guess it does make a bit of an impact. 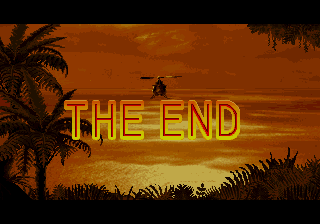 The sounds used seem comparable to that of an upgraded genesis almost, and what gets me every time is the ending. I keep feeling as if the ending song had influence from Phantasy Star 2. What is awesome though are the dinosaur sounds. Whether they are legit to what we think they would sound like or not, it gets the point across to imply that we are really killing dinosaurs. However, with the T-Rex, I don't remember it making the signature roar we may know from the movies, but somehow, whatever roar it makes, suits it somehow. I don't really know most of the dinosaurs names, but the noises suit every dinosaur quite well and just make you feel comfortable in some way that your ears would be bleeding from something that would sound terrible instead. Overall, this game is really worth playing because once you find that charm, you'll probably play it again right away, or a few days after, or even a month from when you play it. It'll find a way back to you. If I'm certain about anything, you should try the real arcade machine for Jurassic Park since the seats move and adjust themselves to whatever the jeep does. It really enhances the feel even if the seats don't move that much but you'd still feel you are in the game. 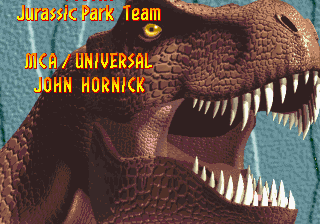 What can be really fun to try with Jurassic Park also is to challenge yourself to losing a few lives as possible and seeing how fast you can speed through boss fights to get under 15 minutes maybe. Another fun thing to do in the game is just really look into some of the things that happen during the game and analyze how insane or ridiculous a few things are. Either way, just check it out. you'll enjoy it. did any one figure out how to fix the video issue? Where the hell is the play button? I honestly don't know how to set up the controls for MAME games, just never ends well. This game is awesome! I remember playing this game at Chuck E Cheese. terrible, i pitty any kid who dumped money into this in an arcade, total cash grab game. i didnt know this was on here. im happy now! they just need to put the second one up and it will be perfect! This game is very fun. Despite how short it is, it is a really good 15 minutes stated by Shogun Gamer. Awesome game. An adrenaline-packed game that keeps you on your toes. Freakin' awesome. You guys need to do mouse support for this game if possible and allow us to turn down sensitivity; it's hard to control the cross hair with my analog stick.